This is my first London blog post! A very special moment after seven years living in this city, and maybe the beginning of some London content sharing. Let me know if that is something you would be interested in! 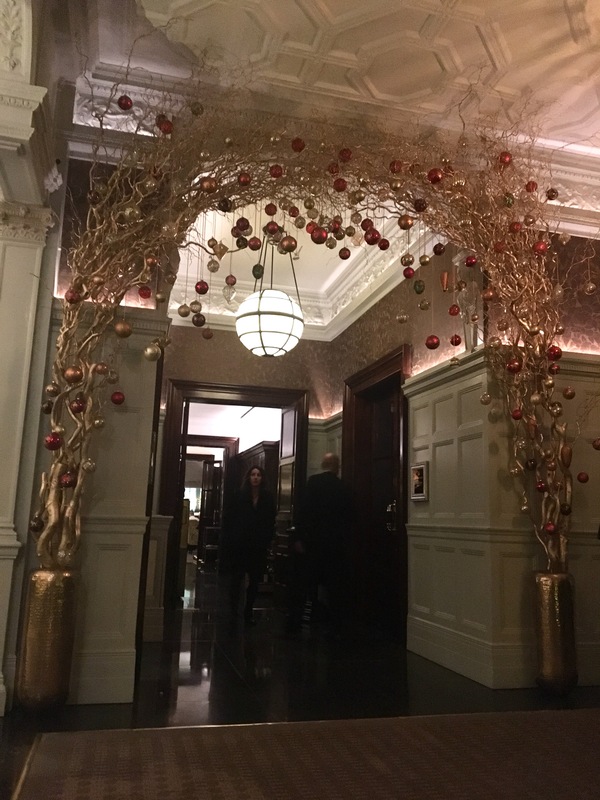 For this special occasion, I picked a very special place to share with you, Hélène Darroze at The Connaught. Not just any restaurant, a two Michelin stars restaurant! Hélène Darroze is a very famous French chef. She is coming from a chefs’ family and began her career working for Alain Ducasse. She worked in Paris, Monaco and now London. The Connaught is a very luxurious hotel, so be aware that the dress code is a little more elegant and I would recommend you avoid jeans and trainers when visiting. Being a few weeks away from Christmas, we didn’t enter a regular hotel’s lobby but a real winter wonderland! The staircase in particular was amazingly decorated! Eating at Hélène Darroze at The Connaught is not only a culinary experience, it is also a brain exercise! You will be invited to take part into the experience, first by playing a game – the ‘what should I have for diner tonight?’ game. One of the most difficult choice I had to make in a restaurant! Leave what you want on the tray, remove the marbles you are not interested in, then look at the waiter organising the marbles in the order the dishes will be served to you. Andrew and I both went for the seven courses option, in my case I picked the grouse, the eel, the foie gras, the halibut, the venison and two desert, the pineapple and the chocolate. A tip I have to share, seven courses was wayyyyy too much, retrospectively I should have gone for five. The portions are rather generous for a Michelin star restaurant and the mistake we made was to want it all instead of being more selective. You are also given a more conventional menu to help you with decide. And for the sake of transparency, here are the prices. Yes, this is a very expensive restaurant, a real treat, but it absolutely worth it, trust me! Once our choices made, the show started, and what a show it was! First we got served fresh bread, with a regular butter and a piment d’espelette butter, and the most delicious dry ham. So delicious that I made friend with our waitress (who was adorable by the way!) and she got me an extra serving! The bread was followed by some ‘amuses bouche’ including a small foie gras pie and a potato churros. If the mains were to be as good as these, we were in for something very special. The first dish I was served was the grouse in the form of a pie. the chunks of meat, foie gras and the light wiped cream all melted together to create the most satisfying autumnal flavours. Next, I was served the eel, which for greediness reasons, I completely forgot to photograph. I was too busy eating it, but trust me it was good! For those of you not familiar with eel it is very similar to white fish just a little meatier. The eel was followed by the most filling of all dish, the foie gras. It was delicious and served with a puff pastry duck roll. Another meat dish followed by another fish dish, the next one was halibut, melting in the mouth, what you would expect a good white fish to taste like. The buttery sauce was excellent! The final savoury dish was probably one of my favourite too. The venison was served medium-rare as it should be (I am French so I don’t do well done). It was served with butternut squash cooked in four different ways. Flavours of winter. At that point my stomach started to ache from being served too much goodness, but I hate waste so I couldn’t bring myself to leave plates unfinished. Unfortunately we weren’t remotely done. Luckily what was to come was delicious and sweet. First came the pineapple dessert which was by far my favourite. It was followed by the chocolate dessert, which I liked less to be completely honest, probably because the pineapple was just so good and hard to compete with. We ended the dinner with two last little ‘gourmandises’ before calling it a night. And when we thought it was all over the waiter came with one last treat for the road! We saved those for the following day and discovered some lovely canelés in there the following morning! An amazing experience that taught us one thing, only order five dishes otherwise you will end in a food coma. It is hard to choose but hopefully this post will help you do so!